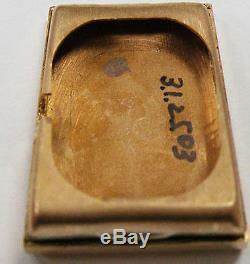 LADIES LUCIEN PICCARD ART DECO 14K ROSE GOLD DIAMOND RUBY WATCH. Watch measures 6 3/4 long. Double square snake chain bracelet perfect condition. 50pts G color SI1 clarity. Copper dial with black hands. Case measures 1 1/2" long X 5/8" wide. 17 jewel mechanical (keeps time). Total weight 27.4 grams. 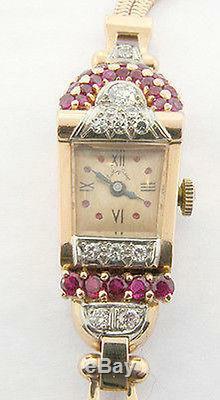 The item "LADIES LUCIEN PICCARD ART DECO 14K ROSE GOLD DIAMOND RUBY WATCH" is in sale since Saturday, May 05, 2012. This item is in the category "Jewelry & Watches\Watches, Parts & Accessories\Wristwatches". The seller is "bellabambino" and is located in Manhasset, New York. This item can be shipped worldwide.